The new figure represents a 4 percentage point bump in usage for iOS 8, which was at 68 percent when Apple last updated the numbers in early January. 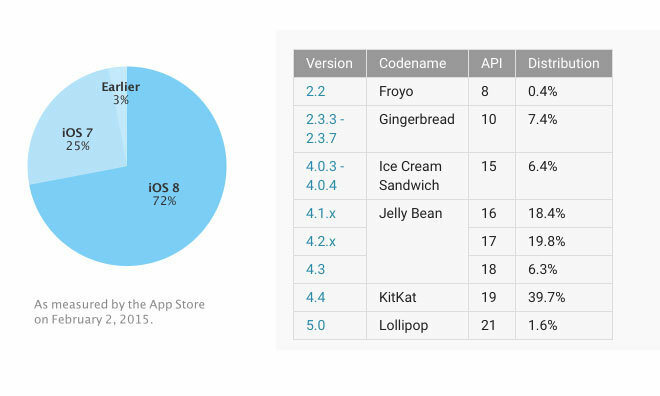 In total, 97 percent of iOS devices are running versions of the operating system released in the last two years. In contrast, recent data from Google's Play Store shows that same figure to be just 41.3 percent. Devices running Android 4.4 KitKat, which was unveiled in 2013, account for the lion's share with 39.7 percent, while 2014's Lollipop clocks in at a mere 1.6 percent. While there is no definitive reason for the disparity in iOS and Android update adoption rates, Apple's direct control over the process is likely a major factor. The company's carrier partners are forbidden from interfering with iOS, a sharp contrast with Android. Aside from the Nexus line, which Google sells directly, Android handsets are subject to a more traditional approach in which carriers and individual handset manufacturers are left to customize the software as they see fit, within certain guidelines. This leads to substantial delays, as customizations must be ported to the new version. Samsung's one-year-old flagship Galaxy S5 is only now beginning to receive Android 5 Lollipop, three months after Google released the new software. Still other handsets simply never get updates at all, as evidenced by the nearly 14 percent of devices still running versions of Android released in 2011 or earlier.